As of roughly 9:00 AM on Wednesday December 11th, the drama surrounding Washington Redskins head coach Mike Shanahan and quarterback Robert Griffin III took a drastic right turn as back-up Kirk Cousins was named the starter for Sunday's game against the Atlanta Falcons. Reports now are saying that Griffin will be shut down for the remainder of the season, but what exactly is the plan behind this tactic? We could assume one of two things: either Shanny is legitimately concerned about keeping his franchise QB healthy for next season or that he never actually wanted RG3 in the first place and is looking to prove that Cousins was his guy all along. Either way, this just goes to show that the circus coming out of Redskins Park is not leaving town anytime soon. This season has certainly not gone according to plan for the 2012 NFC East Champions and Rookie of the Year Mr. Griffin. The list of people to blame is a long one, but unfortunately for Robert and Mike, the majority of the blame falls on them regardless of what the rest of their team is doing. The relationship between these two juggernauts has been questioned for months now since Robert fell to the frigid turf of FedEx Field last year in the playoffs. This season's uninspiring performance has only heated up that debate. So, aside from the fact that the Washington Redskins have the worst special teams in NFL history, a bottom-feeding defense, a porous offensive line, and an incapable receiving corps, Griffin and Shanahan are where the fingers need to be pointed in the eyes of most fans. So is benching Robert for the remainder of the season a smart move or not? Here's how this die-hard Redskins fan sees it. 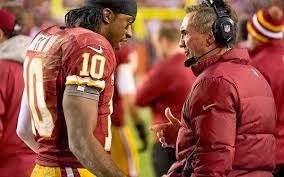 The amount of pressure Robert Griffin III put on himself to play Week 1 this offseason forced him to push his body to the limit during rehabilitation and physical therapy, effectively eliminating any chance for growth in offensive coordinator Kyle Shanahan's system. Many experts and pundits say the key year in this offense is the offseason after Year 1, and Robert essentially regressed due to his focus on his knee and lack of concern for growing within the offense. Now, I cannot blame him for this one bit and I do believe he is the future in D.C., but his lack of pocket presence, accuracy, and ability to read defenses is something extremely disconcerting at this time. has been given the key to the offense for the remainder of the season. Kirk Cousins is a more traditional drop-back passer that should be able to effectively run the offense and get the ball down field. Hopefully, he will be able to show Robert the proper way an NFL quarterback conducts himself in the pocket by not constantly back peddling and actually stepping up to avoid the rush while keeping his eyes down the field. Personally, with the amount of frustration I have experienced in my 15+ years as a fan, I have no problem with this move, mainly because it will answer a great deal of questions for the 2014 season when the team has all of its salary cap back and a non-limited RG3. First off, having a more prone down field passer will allow Redskins front office officials and coaches the ability to better grade out its receiving corps. They will also get a chance to do the same thing with their offensive line. 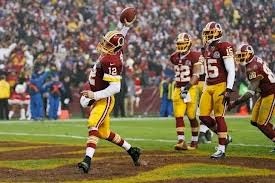 Also, the team will be able to showcase Cousins to the league and either improve the trade market for him or once and for all show that the quarterback in D.C. will be Robert Griffin III for the next decade. There really is no downside to this move by Shanahan minus the fact that his relationship with Robert is likely history at this point; of course that likely will not matter since the head coach's chances of remaining here appear slim at best. Also, Cousins value on the open market could decline, but at least that would mean he would remain a Redskin. Knowing that we will have a 100% healthy Robert Griffin III for Week 1 of the 2014 season is a good feeling, only question is will it still be his job? Scott Eastment is a MLB/NFL/Sport Business writer for Tru School Sports and MLB contributor for Baseball Hot Corner, as well as a digital sports marketing associate with Beyond Sports Network. He is a former college baseball player at Frostburg State University and has his Masters of Business Administration in both sport business and marketing. You can follow him on Twitter, Facebook,Google+, and LinkedIn.